Do you need to see what happened to an email after sending it? Did it reach the intended recipient or was it dropped during transit? Was there an issue with your internal server or there was something wrong with the recipient server? These are just some of the questions which an admin might have to answer if any important email is not delivered on time. 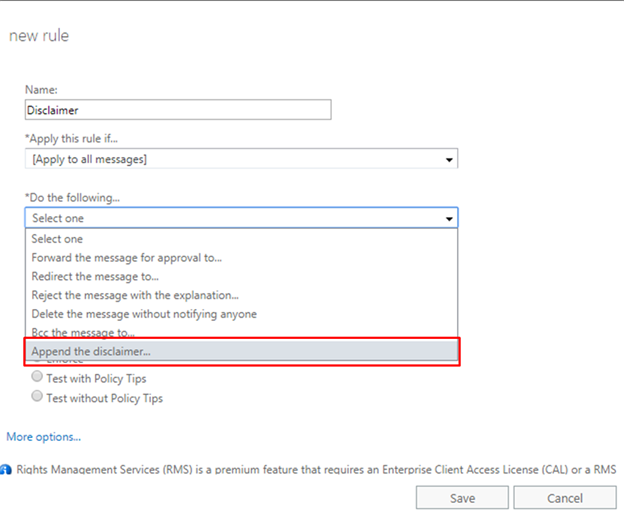 O365 offers a Message Trace Report which shows the delivery details about a specific message. Let’s see how to extract the report. Message trace data is available for the past 90 days. 1. 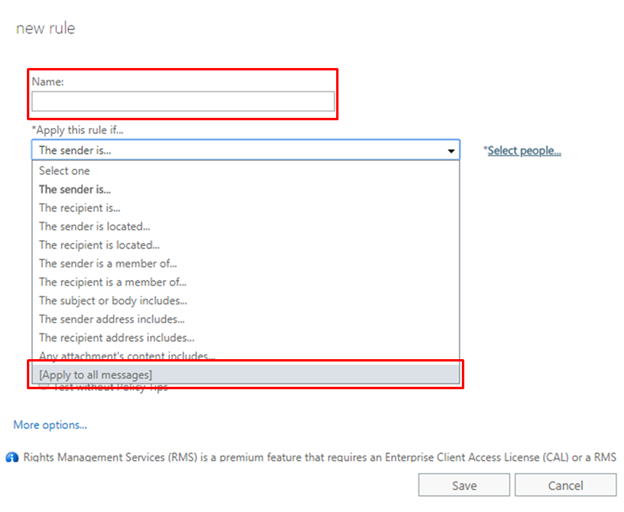 Login to your O365 Admin portal and open Exchange Admin Center. 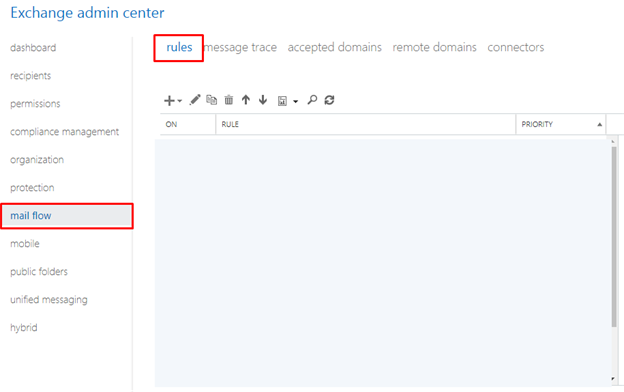 From the left navigation pane select mail flow and then click on rules on the top. 2. Click on the New (+) icon and select Create a New Rule. 3. Give a name to the rule (like Disclaimer or something else) and select [Apply to all messages] from Apply this rule if… field, since Disclaimer is to be set for all senders. 5. Click on the Enter Text… link and enter the disclaimer which you wish to append to outgoing emails from your organization. Click on Select one… to enter the fallback option in case disclaimer could not be appended to the outgoing email. 6. You can leave the rest of the options as it is and finally click on Save. That’s it you are done! Now every outgoing email whether it is being sent from the Browser or Outlook – the disclaimer will be appended magically to each and every email. 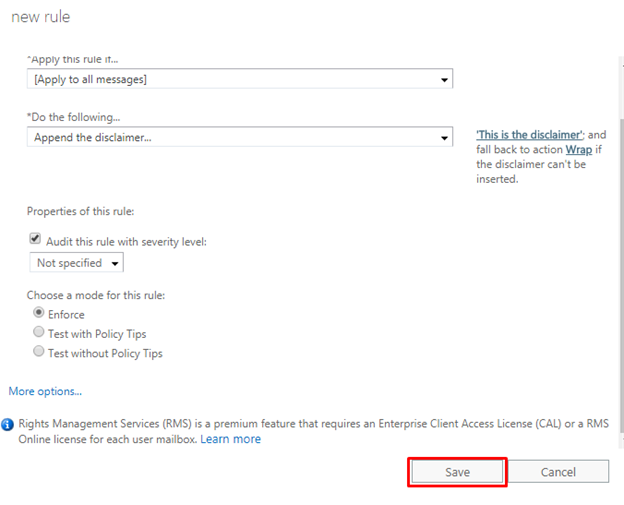 Wrap: If due to some reason the disclaimer can’t be appended, Exchange encloses, or “wraps” the original message in a new message and then the disclaimer is inserted into the new message. Reject: If the disclaimer can’t be appended to the original message, Exchange doesn’t deliver the message. Ignore: If the disclaimer can’t be inserted into the original message, Exchange delivers the original message without the disclaimer.